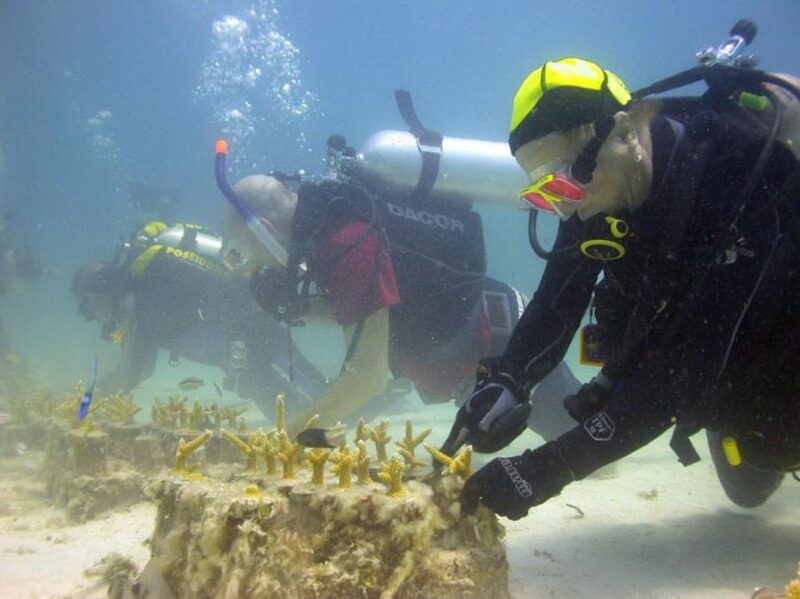 Scientists clean corals in the Florida Keys. The National Marine Fisheries Service, part of the National Oceanic and Atmospheric Administration, would lose 22 percent of its research money under President Donald Trump's budget compared with 2017. President Donald Trump’s budget would slash nearly one in four dollars spent on science research at federal agencies, affecting study of everything from faster airport screening to protecting people from earthquakes and storms, and investigating new drinking water contaminants. Trump’s proposal targets every federal department for cuts – except the Pentagon and Veterans Affairs, where research funding would increase substantially. Overall, Trump’s budget would eliminate more than $30.6 billion, or nearly 21 percent, of research and development funding in fiscal year 2018 compared with 2016, when the Obama administration budgeted $148.3 billion. Adjusted for inflation, those cuts would reach almost 24 percent. The biggest loser would be the Environmental Protection Agency, which would surrender 46.3 percent, or $239 million, of its research and development funds. Five others also face double-digit blows: the departments of Agriculture, Health and Human Services, Interior, Energy and the National Science Foundation. Details of the potential impacts on the federal government’s scientific and engineering research are outlined in a new Congressional Research Service report that analyzed 12 major federal departments and agencies, and compared them with fiscal year 2016, the latest year available for a governmentwide comparison. Robert Cowin of the Union of Concerned Scientists, a research and advocacy group, said the report reveals a clear pattern of White House hostility to the government’s role in science on topics as critical as water supplies, space, oceans, renewable energy, diseases, weather and earthquakes. Under President Donald Trump’s budget proposal, research into the health of the oceans, including fisheries and marine mammals, would be cut at the National Oceanic and Atmospheric Administration. 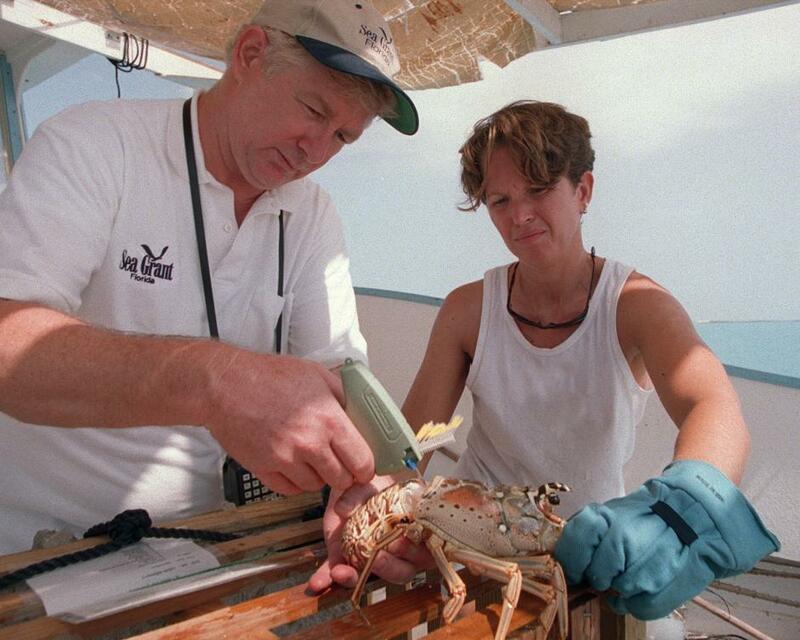 The president’s fiscal year 2018 budget would eliminate funding for the National Sea Grant College Program and Sea Grant’s Marine Aquaculture Program. “That’s troubling, given all the benefits that we’ve enjoyed from that (research),” Cowin said. For instance, the budget would trim a third of the funding for Department of Homeland Security research into making airport security screening faster and less intrusive for passengers while also being better at spotting terrorists. The biggest winner in Trump’s research budget, the Defense Department, would account for almost half of all federal research and development spending, according to the report. The $84.4 billion proposal represents an increase of more than 18 percent in the Pentagon’s research, which ranges from medical topics to destroying chemical weapons and disarming roadside bombs in combat zones. The only other federal agency that would receive a boost is the Department of Veterans Affairs, according to the Congressional Research Service. VA research, such as projects related to the treatment and rehabilitation of injured veterans, would increase by 11 percent, or $135 million. Trump’s budget tells the VA to prioritize suicide prevention, pain management and opioid addiction. Single-digit cuts would be in store for the departments of Commerce (6.8 percent) and Homeland Security (3.1 percent), as well as NASA (3.1 percent). At NASA, money would be stripped from Earth science and climate change research, and the maintenance of an Earth-observing satellite already built and launched with taxpayer dollars. The Energy Department’s investigations into efficiency and renewable energy would take major hits under Trump’s plan to cut its research budget by almost 12 percent. Research into the health of the oceans, including fisheries and marine mammals, as well as science related to climate change and weather, would be cut at the National Oceanic and Atmospheric Administration. Facing a 25 percent cut in research funding, the Agriculture Department would see several labs closed, research programs slashed or eliminated, and no funding for several grants to colleges, including its Women and Minorities in STEM (science, technology, engineering and mathematics) program. The Interior Department’s U.S. Geological Survey would have about 30 percent less money to research earthquakes and land use changes, according to the report. The report focused on just one Department of Health and Human Services program, the National Institutes of Health, the world’s largest biomedical research funder, which would see a 21.5 percent decrease from 2017 under Trump’s budget, according to a report by the nongovernmental American Association for the Advancement of Science or AAAS. So far, the House has rejected that, moving to increase NIH research money by 3.2 percent, according to the AAAS, signaling just one likely flashpoint in the fight ahead. HHS Secretary Tom Price, whose department would lose 19 percent or $6.1 billion – the most research and development dollars of any in the government – said in May that Trump’s budget “outlines a clear path toward fiscal responsibility by creating efficiencies that both improve services and save money.” Even before action on the 2018 budget, Price has already eliminated the department’s funding for teen pregnancy prevention research. “Just as families decide how to manage limited budgets, we must ensure the federal government spends precious taxpayer dollars only on our highest national priorities, and always in the most efficient, effective manner,” the president said. For years, a cost-cutting Congress has been backing away from what had been a strong public commitment to innovation in energy, technology, health and the environment. Public investment in non-defense research and development has been essentially flat since 2004, except for a one-off boost from the 2009 stimulus act. But the cuts in the Trump budget go far deeper than the belt-tightening Republicans in Congress have advocated. In response, Congress is starting to push back, with House bills that contain more money than the president requested for specific programs, and Senate bills offering more than the House. At the EPA, for example, a House bill would reduce research by 14.4 percent rather than Trump’s 46.3 percent. With the House and Senate recessed for August, Congress hasn’t agreed on a final budget for fiscal year 2018, which begins Oct. 1. The AAAS says the congressional proposals risk violating statutory spending caps. The Budget Control Act of 2011, which President Barack Obama signed into law to resolve a federal debt standoff with Congress, requires annual cuts in discretionary spending through 2021. If cuts aren’t deep enough, that could trigger automatic, across-the-board cuts to all agencies. To avoid that, Congress would have to reach a temporary deal to waive the caps, as it has done before. “The bottom line is that much of what Congress has produced is not workable under current law,” Matt Hourihan, the AAAS research and development budget analysis director, wrote in another report on Aug. 1. Energy research shows how Congress, while seeming generous compared with Trump, still would cut federal support in key areas. For example, Trump wants to reduce research funding for efficiency and renewables by nearly 70 percent from fiscal year 2017 levels, to $636 million, according to the AAAS. Some initiatives would be eliminated. In the House, that research funding would drop by 48 percent, to $1.086 billion. Even the Senate’s much larger figure, $1.937 billion, would be a 7.3 percent cut. One of the smallest yet effective health research programs eliminated in Trump’s budget: the Fogarty International Center, which for 50 years has funded international health research. All $70 million for the center would disappear. The House, however, wants to keep the center alive, adding $3 million. Without Fogarty’s support, some ongoing investigations in Peru, Brazil and Mexico into Zika, Chagas and dengue – diseases that are posing increased danger in the United States – would halt. Researchers say Fogarty, a unit of the National Institutes of Health, also has been vital in the fights against HIV and Ebola. In an interview on the center’s website, Kenyan Dr. Ruth Nduati of the University of Nairobi, a former Fogarty trainee, said many people are alive today because of the U.S. funds. “Fogarty has changed the face of HIV medicine,” she said.